Staff Selection Commission (SSC) has issued notification regarding the application for Combined Graduate Level (CGL) Tier 1 exam 2018. The online process for the SSC CGL 2018 Tier 1 has been started from 5 May & will end by 4 June. As per the notification, the exam will be held for fill up Group B & C posts under different departments / ministries / organization of Indian Government. The Staff Selection Commission (SSC) has rolled out notification for CGL 2018 exam on the official website on 5th May only. If you are interested in applying for any post under SSC CGL 2018, then check out the important dates, eligibility, application process & more regarding the SSC CGL 2018 (Tier I, II, III & IV) below. SSC CGL Tier 1 Exam Date: 25 July to 20 August. Whereas the Tier II, III & IV exam for the SSC CGL 2018 will be notified after Tier 1 exam. And the application will only be submitted through the online mode only, whereas the payments details have also been mentioned in the notification. For all those candidates who have been waiting to fill up the application forms for SSC CGL exam 2018, can simply follow these steps & register themselves for the same. Open the official website of Staff Selection Commission i.e ssconline.nic.in. Click on the click here to apply button under Recruitment for CGL 2018. First, check the details of SSC CGL 2018 recruitment notification for candidates and then register your self for the same. After filling up the registration form, ID & Password will be generated that will help you for further login on the official website of Staff Selection Commission. 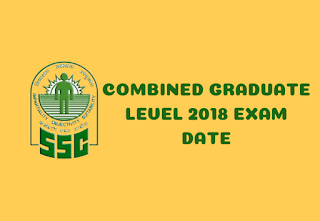 Now fill up the online application form for SSC Combined Graduate Level exam 2018. Finally, pay the fee & take a print out of your filled application form for your reference. Candidates for the Staff Selection Commission for CGL exam 2018 are requested to read out the instructions regarding the age limit, eligibility, number of vacancies & details of posts on the official website only. We wish best of luck to all SSC CGL 2018 applicants.